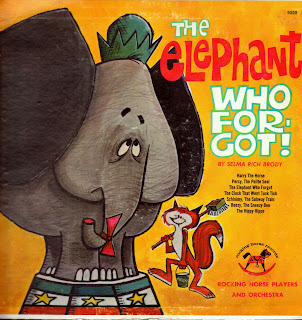 These are some fun animal stories narrated by the unmistakeable voice of Arnold Stang. (If you don't recognize the name, you'll certainly recognize his voice!) I thought it odd that that fact isn't advertised on the record cover itself. It is mentioned on the record's label though. Part of me wonders if these were originally meant to be collected together (although the last story does reference the first one). The reason I say that is because Stang uses his standard voice for every single story. He's got others (He was the voice of Top Cat after all), but there's no variation on the characters here. I think it's still pretty neat, and I hope you do too! ...and Selma Rich Brody rides again! I am so glad to find a copy of this album. I had a similar album (same content; different cover). My album was put out by Peter Pan Records, and had Arnold's picture on the cover. How these stories and songs take me back! !